Written and illuminated in France in the mid-13th century, this Psalter was owned in the 15th century by Anne Felbrigge (whose family came from Felbrigg, a few miles inland of Cromer, on the Norfolk coast) who was a member of the community of Franciscan nuns at Bruisyard, in Suffolk, between Saxmundham and Diss. Its most striking feature are the panels of medieval embroidery, made around the year 1300, inlaid into each cover of the binding. 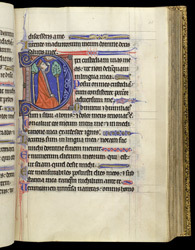 Psalm 38 begins 'I said, I will take heed to my ways, that I sin not with my tongue', and is usually illustrated in French Psalters such as this with an image of King David on a pathway (heeding his 'ways'), or pointing to his tongue. Here, by contrast, he is shown pointing to his eyes. It seems as if the artist has accidentally used the imagery which normally accompanies Psalm 26.